Mérida is the capital of the autonomous community of Extremadura, western central Spain. Kick off your visit on the 7th (Sun): make a trip to Acueducto de los Milagros, then get engrossed in the history at Museo Nacional de Arte Romano, then don't miss a visit to Templo de Diana, and finally snap pictures at Roman Bridge. To see ratings, traveler tips, other places to visit, and tourist information, refer to the Merida visit planner . Cascais, Portugal to Merida is an approximately 3-hour car ride. You can also take a bus; or take a bus. The time zone difference when traveling from Cascais to Merida is 1 hour. In April, plan for daily highs up to 24°C, and evening lows to 11°C. Wrap up your sightseeing on the 7th (Sun) early enough to drive to Madrid. On the 8th (Mon), don't miss a visit to Plaza de Oriente, then explore the world behind art at Royal Palace of Madrid, then hunt for treasures at Mercado San Miguel, and finally stroll around Retiro Park. To find maps, more things to do, ratings, and more tourist information, you can read our Madrid online itinerary planner . Drive from Merida to Madrid in 3.5 hours. Alternatively, you can take a bus; or take a train. In April, daytime highs in Madrid are 22°C, while nighttime lows are 9°C. Finish up your sightseeing early on the 9th (Tue) so you can catch the train to Valencia. 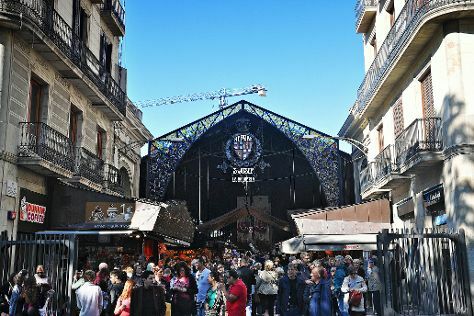 Plan a Valencia trip in moments using our itinerary builder. You can take a train from Madrid to Valencia in 2 hours. Alternatively, you can fly; or drive. In April, plan for daily highs up to 25°C, and evening lows to 12°C. On the 9th (Tue), wrap the sightseeing up by early afternoon so you can travel to Barcelona. To find maps, reviews, traveler tips, and more tourist information, you can read our Barcelona sightseeing planning website . You can fly from Valencia to Barcelona in 3 hours. Other options are to take a train; or drive. Traveling from Valencia in April, you will find days in Barcelona are slightly colder (22°C), and nights are about the same (13°C). Wrap up your sightseeing by early afternoon on the 11th (Thu) to allow enough time to take a train to Montpellier. "Montpellier is a modern, compact, and fast-growing city about 10 km (6 mi) inland from the Mediterranean coast with an active, youthful vibe. To see where to stay, other places to visit, reviews, and more tourist information, refer to the Montpellier trip itinerary planner . You can take a train from Barcelona to Montpellier in 3 hours. Other options are to drive; or take a bus. In April, plan for daily highs up to 22°C, and evening lows to 11°C. Cap off your sightseeing on the 11th (Thu) early enough to go by car to Saint-Remy-de-Provence. Saint-Rémy-de-Provence is a commune in the Bouches-du-Rhône department in southern France.HistoryThe town is named after Saint Remigius.GeographySaint-Rémy-de-Provence is situated about 20km south of Avignon, just north of the Alpilles mountain range.TransportationThe high-speed train station is 20 km from the city. For ratings, photos, and tourist information, go to the Saint-Remy-de-Provence travel route site . Traveling by car from Montpellier to Saint-Remy-de-Provence takes 1.5 hours. Alternatively, you can take a train; or do a combination of train and bus. April in Saint-Remy-de-Provence sees daily highs of 23°C and lows of 9°C at night. You will leave for Forte Dei Marmi on the 12th (Fri). Forte dei Marmi is a sea town and comune in the province of Lucca, in northern Tuscany (Italy). Escape the urban bustle at Botanical Garden Maria Ansaldi Pania di Corfino and Bagno Stella Focette. Head to Consorzio Vacche Rosse and Mercato Albinellifor plenty of shopping. Change things up with these side-trips from Forte Dei Marmi: Carrara (Marble Caves of Carrara & Asciutti Carlo), Portovenere (in Porto Venere) and Parma (Cattedrale di Parma & Battistero di Parma). Next up on the itinerary: tour the pleasant surroundings at Nona - Matanna da Stazzema, Head underground at Grotta del Vento, head outdoors with Garfagnana Activities, and make a trip to Terrazza Mascagni. 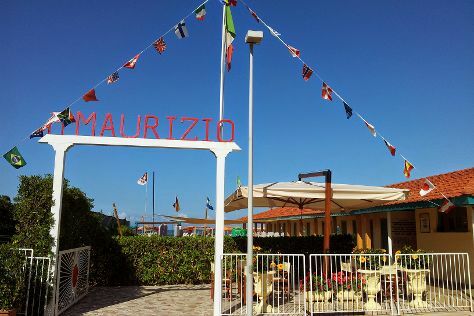 To find maps, where to stay, reviews, and other tourist information, refer to the Forte Dei Marmi trip itinerary planning website . Traveling by car from Saint-Remy-de-Provence to Forte Dei Marmi takes 6.5 hours. Alternatively, you can fly. April in Forte Dei Marmi sees daily highs of 22°C and lows of 9°C at night. Wrap up your sightseeing on the 22nd (Mon) early enough to travel to Menton. Known for its own microclimate that is generally milder than the rest of the French Riviera, Menton is located very close to the border with Italy, whose influence is visible in the architecture and customs of the city. Kick off your visit on the 23rd (Tue): admire the natural beauty at Les Jardins Bioves, then get to know the fascinating history of Promenade Le Corbusier, and then contemplate the long history of Basilica St. Michel. To find other places to visit, reviews, ratings, and more tourist information, you can read our Menton driving holiday planner . Drive from Forte Dei Marmi to Menton in 4 hours. In April in Menton, expect temperatures between 20°C during the day and 13°C at night. 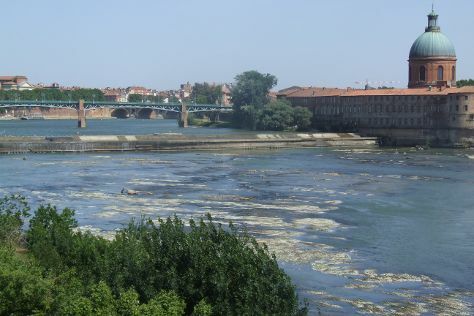 Wrap up your sightseeing on the 23rd (Tue) to allow time to travel to Toulouse. On the 23rd (Tue), contemplate the waterfront views at Garonne, then contemplate the long history of Church of Les Jacobins, then meet the residents at Zoo African Safari, and finally take in the spiritual surroundings of Basilique Saint-Sernin. For maps, other places to visit, and more tourist information, you can read our Toulouse trip planner . You can fly from Menton to Toulouse in 4 hours. Alternatively, you can drive; or take a train. Traveling from Menton in April, plan for little chillier nights in Toulouse, with lows around 9°C. Wrap up your sightseeing by early afternoon on the 24th (Wed) to allow enough time to drive to San Sebastian - Donostia. To find other places to visit, reviews, where to stay, and tourist information, refer to the San Sebastian - Donostia trip itinerary maker app . Traveling by car from Toulouse to San Sebastian - Donostia takes 3.5 hours. Alternatively, you can take a bus; or do a combination of flight and bus. In April, daily temperatures in San Sebastian - Donostia can reach 20°C, while at night they dip to 11°C. Wrap up your sightseeing on the 24th (Wed) early enough to drive to Salamanca. Salamanca is one of the most visited cities in Spain. Kick off your visit on the 25th (Thu): test your problem-solving skills at popular escape rooms, stop by El Motin Del Te, explore the world behind art at Museum of Art Nouveau and Art Deco Casa Lis, contemplate the long history of Old Cathedral (Catedral Vieja), then contemplate in the serene atmosphere at New Cathedral (Catedral Nueva), and finally pause for some serene contemplation at Ieronimus. Keep things going the next day: get to know the fascinating history of Salamanca,Casco Historico, take in the views from Puente Romano, and then don't miss a visit to Plaza Mayor. For other places to visit, ratings, and tourist information, read our Salamanca online sightseeing planner . Drive from San Sebastian - Donostia to Salamanca in 4.5 hours. Alternatively, you can take a bus; or take a train. Traveling from San Sebastian - Donostia in April, you can expect nighttime temperatures to be a bit cooler in Salamanca, with lows of 5°C. Finish your sightseeing early on the 26th (Fri) so you can drive back home.